Here's a bit of a break from this site's usual headache of puzzling over King Wen's sequence -- a hexagram sequence that can actually be figured out. 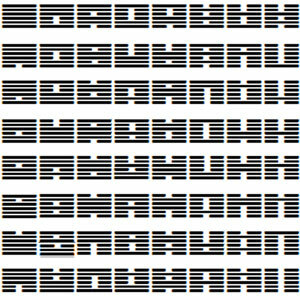 In the Wilhelm-Baynes edition of the i-Ching, there's a sequence of hexagrams in the back called the "mystery sequence." A discussion of this recently popped up on an i-Ching list to which I belong. Someone translated the diagram into text and posted it. I've translated it back into hexagrams and I'm posting the graphic here. You can extrapolate the rest from here. Three yins enter together, then are separated by one, then two yangs, etc. Here's an animation. Forgive the quick and dirty rendering, I will clean it up when I have more time. It serves its purpose. Reload the page to start it from the beginning. It will seem way too slow for the first 16 or so hexagrams, but trust me, you'll be glad for the extra time at the end when it gets a lot more complex. For a faster animation, click here. The sequence is interesting on a number of levels. For one thing, yin sinks, it doesn't rise. So the fact that yin is rising throughout this sequence seems to indicate that there is something "unnatural" about the mechanic being depicted (at least in the context of classical yin-yang mechanics). It's striking that yang here is basically immobile. Yang is usually the dynamic part of the yin-yang equation. Yin is always rising if you read the sequence front to back. But if you reverse the sequence, you do NOT get yang sinking consistently (see especially the second to the last column). So it's not a reversible sequence. Yang is the backdrop for yin. 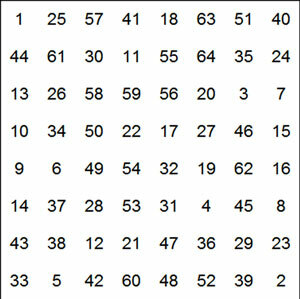 In the third column, about the fifth hex down, the pattern seems to break down a bit, or rather it gets very subtle. If you look at how the splits in yin clumps occur, it's kind of hard to discern the exact pattern. The key here is that when yin separates, the separation starts in the second line (reading from bottom to top). The second separated yin group is evenly distributed -- two and two. In the final sequence -- five yins -- the yang line simply enters at the bottom and cycles to the top. This is technically a break in the pattern. If the last column was consistent with the previous columns, the five-yin sequence would have started with five yins at the bottom, then five yins rising to the top -- i.e., hexagrams 23 and 24 according to the King Wen numbering. If the pattern (as I am judging it) was totally consistent, the last seven hexagrams would be (from top to bottom) 23, 24, 7, 15, 16, 8 and 2. Instead, they are 24, 7, 15, 16, 8, 23 and 2. Instead, the run starts with 24 (Return), the single yin rises to the top for 23 (Stripping Away) and then the final hex is 2 (Pure Yin). This appears to be a concession to the hexagram meanings (?) -- Return signifies the return of yang, whereas stripping away would remove yang according to the normal yin-yang mixing dynamics. In short, the final run is somewhat of a reversal of the previous sets since yin is now sinking -- the only place in the entire sequence where yin sinks. The switch-up here also contributes to making the overall sequence non-reversible. With all this in mind, I suspect the design has a Taoist thrust and is meant to represent the corruption of yang (celestial energy) by temporal influences (yin). Alternatively (or perhaps additionally), it may have a function in terms of Taoist occultism. In occultism generally, reversed operations are thought to be extremely powerful in terms of manipulating the physical world. The map here might be a model for twisting celestial energy around into temporal power. The fact that yin separates before increasing may also point to an occultist -- or more correctly, alchemical -- orientation. At each level, yin surrounds yang, possibly with an eye toward channeling or controlling its flow. One final argument for the "mystery sequence" as a "brute force" alchemical diagram -- its lack of elegance. The arrangement is notably lacking in symmetries, or any of the traditional correspondences or relationships between hexagrams -- such as the pairs, the nuclear hexagrams, trigram distribution, doubled-trigrams, yin-yang opposites, etc. Frankly, you almost have to set out deliberately to create an ordered arrangement of the hexagrams. The "rising yin" and the lack of reversibility for the sequence as a whole are especially unusual. The narrative structure favours an alchemical reeading as well. For instance, the top row hexes mostly represent beginnings -- Initiating, The Unexpected, Pentrating, Decrease, Removing Corruption, After Completion, Arousing and Deliverance. Most of the bottom hexagrams in each column, on the other hand, represent stopping in some capacity -- Retreat/Withdrawal, Waiting, Increase, Limitation, Cauldron, Keeping Still, Obstruction, Earth/Responding. The Increase/Decrease pair is the only really counterintuitive element of this pattern. Taken as a whole, it's pretty easy to envision the grid as an eight-part recipe for alchemy, with each column then subdivided further into eight steps. Some of these have fairly obvious resonance. Increase into Decrease into Limitation. Removing corruption into the Cauldron. After completion into keeping still.